Linda Evangelista, by Patrick Demarchelier. 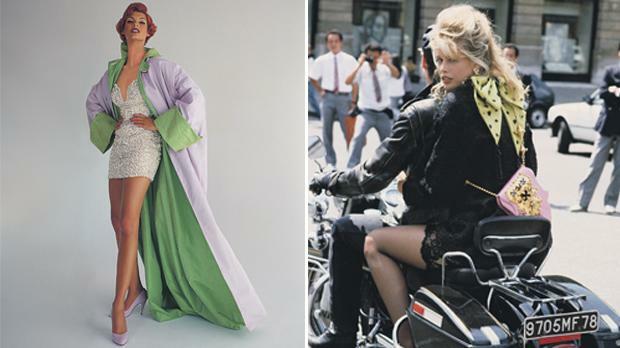 Right: Claudia Schiffer, by Herb Ritz. The Beatles, by Peter Laurie. Photos: The Condé Nast Publications Ltd. Prior to their loan to the Gallery, the two photographs had not been displayed in public since they were taken. The Beatles portrait has remained unpublished in Vogue’s archives until now, while the Jude Law image was published in British Vogue in 1996, but has not since been shown in a gallery or museum. Albert Watson photographed the then 23-year-old Jude Law, along with other British actors and directors, at a studio in London for the March 1996 edition of British Vogue. The 20-page special celebrated 100 years of British film as a tribute to British cinema, and featured new photographic portraits of eminent 1990s British actors, directors, scriptwriters and producers. 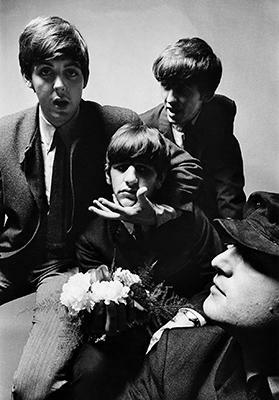 Diana Vreeland at American Vogue commissioned the Beatles portrait by the young British Vogue staff photographer Peter Laurie in 1964. The idea was suggested to Vreeland by her British assistant art director, Nicholas Haslam, who was dispatched to Northampton to have them photographed after a concert. Scheduled also for publication in British Vogue, the moment came and went, but the portrait lay unpublished in the magazine’s archives. The photographs will be displayed alongside the many faces that have shaped the cultural landscape of the 20th century, from Henri Matisse to Francis Bacon, Lucian Freud and Damien Hirst; Marlene Dietrich to Gwyneth Paltrow; Lady Diana Cooper to Lady Diana Spencer; and Fred Astaire to David Beckham. Other highlights of the exhibition include the entire set of prints from Corinne Day’s controversial Kate Moss underwear shoot, taken in 1993 at the pinnacle of the ‘grunge’ trend; Peter Lindbergh’s famous 1990 cover shot that defined the supermodel era; a series of exceptional World War II photographs by Vogue’s official war correspondent, Lee Miller; a rare version of Horst’s famous ‘corset’ photograph from 1939, which inspired the video for Madonna’s hit song Vogue; and vintage prints by the first professional fashion photographer, Baron de Meyer. 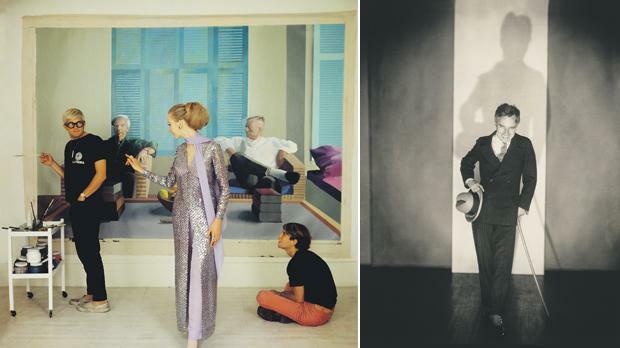 David Hockney, Peter Schlesinger and Maudie James. Right: Charlie Chaplin, by Edward Steichen. British Vogue was founded in 1916, when World War II made transatlantic shipments of American Vogue impossible and its proprietor, Condé Nast, authorised a British edition. It was an immediate success and over the following 10 decades of uninterrupted publication, the magazine continued to mirror its times and put fashion in the context of the wider world – the austerity and optimism that followed the two world wars; the Swinging London scene in the 1960s; the radical 1970s and the image-conscious 1980s. In the magazine’s second century, it remains at the cutting edge of photography and design. The exhibition is curated by Robin Muir who is a contributing editor to British Vogue. He has arranged many exhibitions over the last 20 years focusing on fashion and portrait photography, including Under the Influence: John Deakin and the Lure of Soho at the Photographers’ Gallery (2014); Unseen Vogue: The Secret History of Fashion Photography at the Design Museum (2002); and Snowdon: A Retrospective at the National Portrait Gallery (2000). Muir has also curated major exhibitions for the Victoria &Albert, the Museum of London, and the Yale Center for British Art. His books include People in Vogue: A Century of Portraits (2003) and Vogue Model (2010). Vogue 100: A Century of Style runs until May 22 at the National Portrait Gallery London, the UK as part of the magazine’s centenary celebrations.